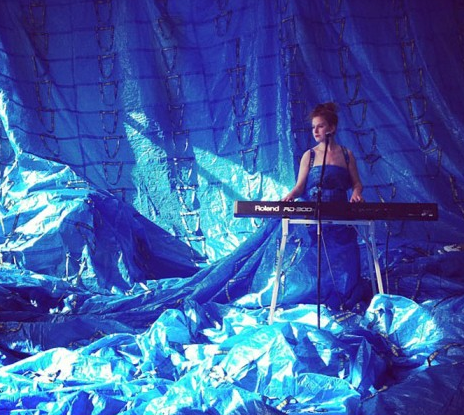 The fabulous site inhabitat featured today Ida-Marie Corell‘s Ikea gown, the centerpiece of her installation in a show called “Oh, Plastiksack” at the Gewerbemuseum in Winterthur, Switzerland. In trying to find out more about both the artist and the show, I came across Corell’s wonderful Plastic Bag Blog, which I’ll be adding to the blogroll and trolling for content on the regular from now on. She also has a book out about plastic bags, German-reading trashies consider this an open call for a guest post review. Sara Bayles‘ blog The Daily Ocean chronicles trash she finds on the beach every day for a year. Recently, she and her husband took nine weeks to join a sea expedition to the Great Pacific Garden Patch. She’s now posting details of the trip and photos in a series of posts before returning to the regularly scheduled program. The green blogs are abuzz. 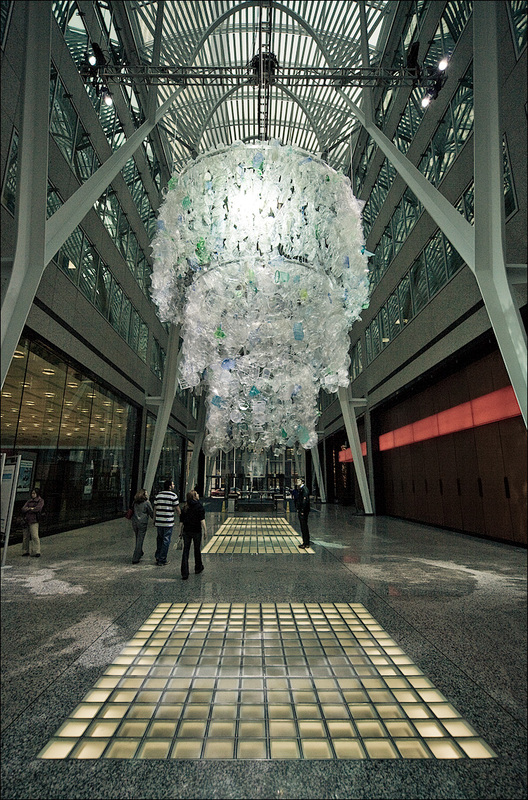 Did you virtually attend the TEDx Great Garbage Patch—an independently organized TED conference focused on plastic—this weekend? If not, here’s a link to everything that went down. And Beth Terry of FakePlasticFish has a great overview of Van Jones‘ presentation here. Knock yourself out, plasticheads. There’s a LOT of good stuff here. The video gallery alone could consume an afternoon. I’m still catching up, more to come. 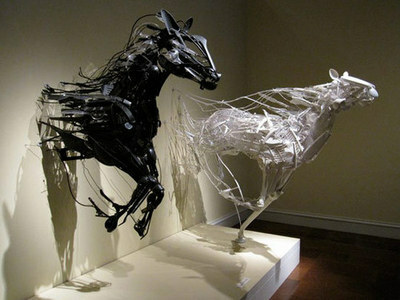 Amazing sculptures made from plastic utensils via renest by way of unconsumption. Sorry for the unannounced hiatus. I’m in Uganda for work. 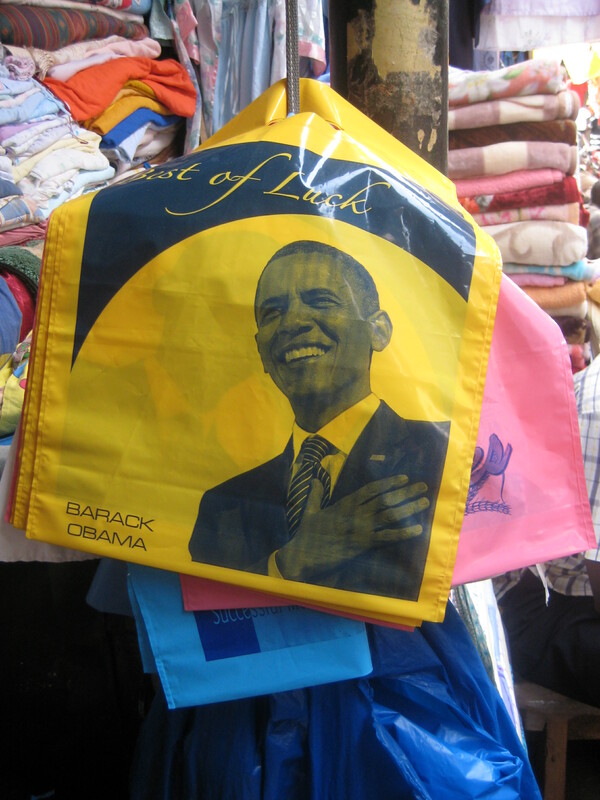 Pushing my way through the narrow aisles of Owino market in Kampala the other day, I turned a corner ot face this: a plastic bag bearing President Obama’s face with “Best of Luck” written accross the top. Profoundly depressing on a number of levels. More images of Ugandan trash on Facebook. A quick how-to on making bioplastic in your kitchen via MAKE. Laser cutter not included. Did you catch the NYT piece on the garbage patch last week and/or check out the accompanying slide show? The author of that article is Lindsey Hoshaw, a freelance journalist who spent three weeks this summer aboard the Oceanographic Research Vessel Alguita on an expidition led by Captain Charles Moore to explore that great swatch of plastic in the sea. Check Hoshaw’s blog and puruse the archive for a first-hand account. Notice the link to spot.us at the bottom of the NYT article. It’s a tool for freelancers to raise funds for their reporting, supporters of which helped to finance Hoshaw’s research. How thoroughly modern. Side note: in Googling links for this post, I came accross another Garbage Girl, a woman working at a landfill and blogging about it. Stay tuned for more on women and trash. Project Kaisei, a recent expedition to further test the Great Pacific Garbage Patch, is complete. Mother Jones has the story. Thanks, Alexandra, tipster of the month! Keith R. over at The Temas Blog has been periodically updating a series of trash photos of amazing things made from garbage in Latin America. 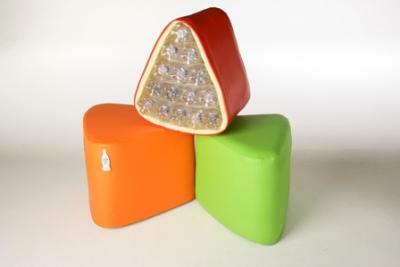 The latest installment features sofas and pouffes made from PET bottles in Brazil as part of a project called Reciclagem e Cultura or “Recycling and Culture.” Apparently what began as an upcycling (thanks for the shout out, Keith) endeavor blossomed into an income-generating business program. I’m headed to Rio tomorrow night for vacation. I wonder if I’ll meet anyone with an ecological pouffe! Now comes what could be more bad news. A new study, announced at a recent meeting of the American Chemical Society, suggests that plastics in seawater break down faster than expected. As they do, they apparently release contaminants, including potentially harmful styrene compounds not normally found in nature.